Findings from Sesame Workshop’s initial “Elmo/Broccoli” study indicated that intake of a particular food increased if it carried a sticker of a Sesame Street character. For example, in the control group (no characters on either food) 78 percent of children participating in the study chose a chocolate bar over broccoli, whereas 22 percent chose the broccoli. However, when an Elmo sticker was placed on the broccoli and an unknown character was placed on the chocolate bar, 50 percent chose the chocolate bar and 50 percent chose the broccoli. My reaction: Give me a break. You’re seriously asking me to believe that 22% of preschool kids will spontaneously choose a piece of broccoli over a chocolate bar? And that merely slapping a picture of Elmo on the broccoli will increase that to 50%? Sorry. I’m not buying it. Researchers went into schools and showed children two cards: one with a picture of broccoli, the other with a snapshot of chocolate. At this stage, 78 percent of the kids preferred the chocolate card. When researchers put Elmo in the chocolate card and a generic red puppet in the broccoli card, the preference for chocolate shot up to 89 percent. But when Elmo was placed next to the broccoli and the generic character next to the chocolate, children’s preferences split right down the middle. The Atkins grant will fund a broader study that uses real foods rather than photos (as in the first study), and will fund research to see the impact of product placement (broccoli, not chocolate) in Sesame Street episodes. Research begins as early as fall, with results as early as fall 2006. Hmmm. And what happened to this study? Beats me. If it ever got completed, I can’t find it. That might be because I don’t know how to search for it properly, or it might be because it produced null results and therefore got tossed in the same dustbin as all the other null results that make for boring reading and never find a home. If anybody knows anything about it, let us know in comments. 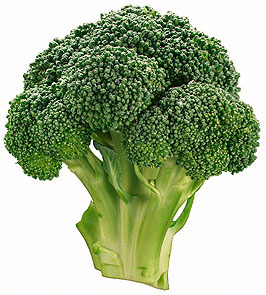 DISCLOSURE NOTIFICATION: Like our 41st president, I can’t stand broccoli. And I adore chocolate. So I’m naturally skeptical. It’s true that we’ll be having broccoli with our roasted chicken tonight, but only if by “we” you actually mean “Marian.” I’ll be having a salad or something.